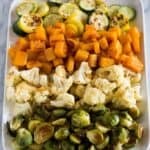 A how-to guide for making perfect Roasted Vegetables with a variety of vegetables, including brussels sprouts, butternut squash, zucchini, cauliflower, and broccoli. Preheat oven to 425 degrees F. Lightly spray a baking sheet with nonstick spray. Place vegetables in a large bowl. Add olive oil, garlic and herbs de provence; season with salt and pepper, to taste. Gently toss to combine. Pour vegetables into a single layer on the baking sheet. Bake for 12-15 minutes, or until tender. (Baking time may vary depending on the size of your vegetables).